» Rule #4: The natural course of a spamming business is to go bankrupt. Quoting from http://bruce.pennypacker.org/2005/02/28/the-rules-of-spam/ of course. This morning, when reading the Kauppalehti from a day or two ago, I spotted a few familiar looking entries in the “Protestilista” (lists of businesses with debts that have been going bad for a while and have been officially protested against). One Response to Rule #4: The natural course of a spamming business is to go bankrupt. 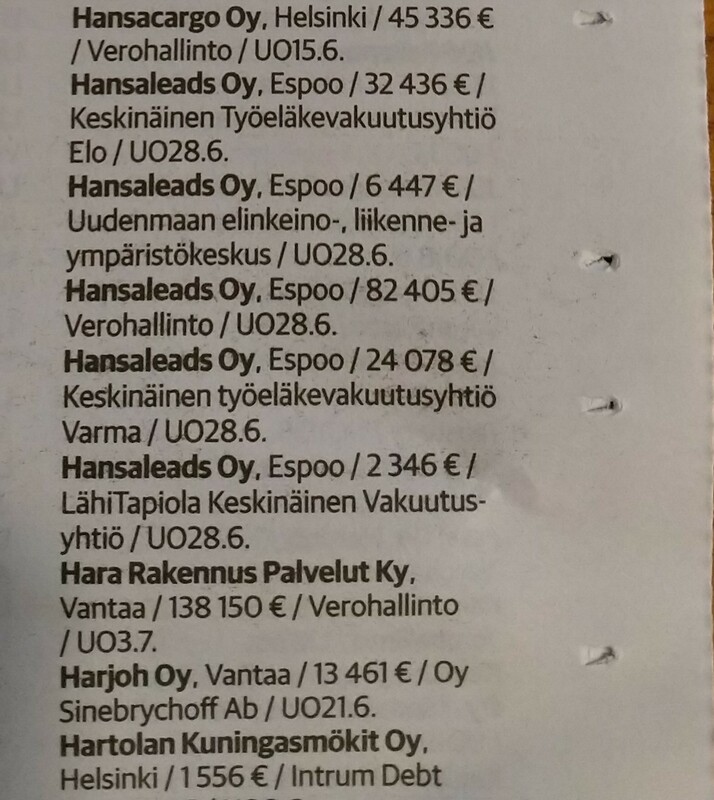 The Virallinen lehti (Official Newspaper, a government publication containing official announcements) has stuff related to Hansaleads in issues 17, 23, 26, 66 and 80 this year so far. The matters in Issue 80 concern Sender Suomi Oy, their left hand. The matters in issue 26 have to do with their claiming a customer of theirs left bills unpaid. The rest have to do with the government having had to step in to ensure employees got paid – apparently they have routinely failed in paying their employees the agreed salary, starting at least a year ago.